Come to the cavalcade of the magi of Barcelona. The most magical night of the year is coming to fill illusions and gifts for all kids. Tomorrow, January 5th, Barcelona will fill its streets to welcome the 3 wise men. A real parade as tradition marks. Are you going to miss the most magical parade of the year? The cavalcade of the Magi, as the tradition marks. The Magi will disembark in the Moll de la Fusta of Barcelona at 16h30. Once received the key of the city at the hands of the mayor, the royal parade with all the floats, will begin at 18h in the afternoon from the entrance of the park of the Ciutadella. 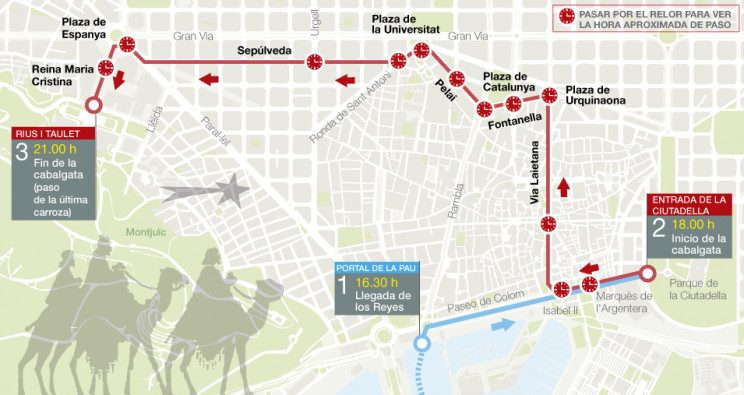 A parade of floats that maintains the usual route, from Marquès d’Argentera, through Pla de Palau, Via Laietana, Urquinaona Square, Fontanella Street and Plaza Catalunya. From there, you will continue along Pelai Street, Ronda Sant Antoni, Sepulveda Street, Paral.lel Avenue, Plaza Espanya and end at Avenida de Reina Maria Cristina. The Magi will parade next to other floats adorned for the occasion from where they will throw candies and also, 80 real pages that will be in charge of collecting the letters that the children have written to ask their gifts to their majesties. In addition, Melchor, Gaspar and Baltasar this year release new floats. These will be inspired respectively in the gardens of spaces such as the Alhambra of Granada, in an enchanted forest with typical fountains of the Japanese gardens and in masks of animals, typical of the African iconography. This year, more than 1,200 participants will parade in the five kilometers of route. Come to welcome your majesties the Three Kings in one of the points of the tour of the cavalcade.